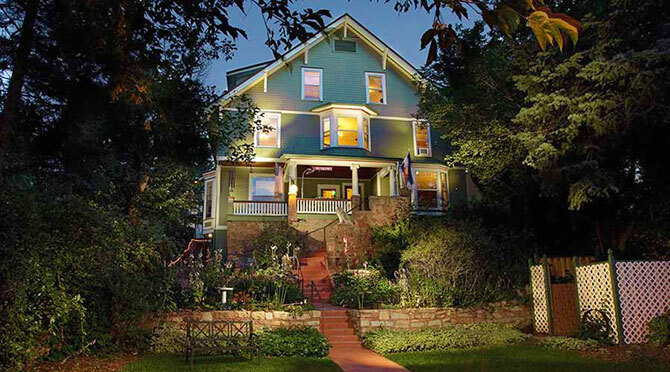 The Avenue Hotel Bed and Breakfast welcomes those looking for an adult retreat. A place that offers a peaceful escape, away from the hustle of everyday life. 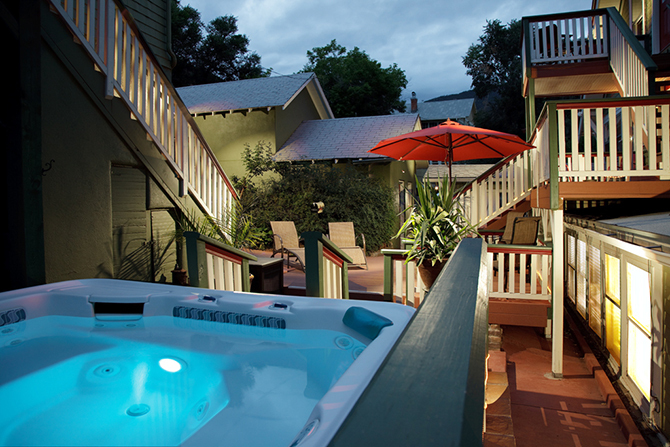 Soak away the stress in our private hot tub, perfect for an evening under the stars. Relax in vintage comfort with an on-site massage. 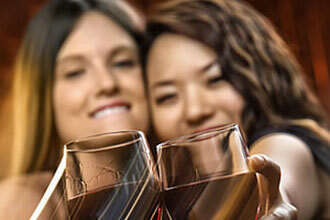 Indulge while you stay with one of our special getaway packages. Feeling up for an adventure? 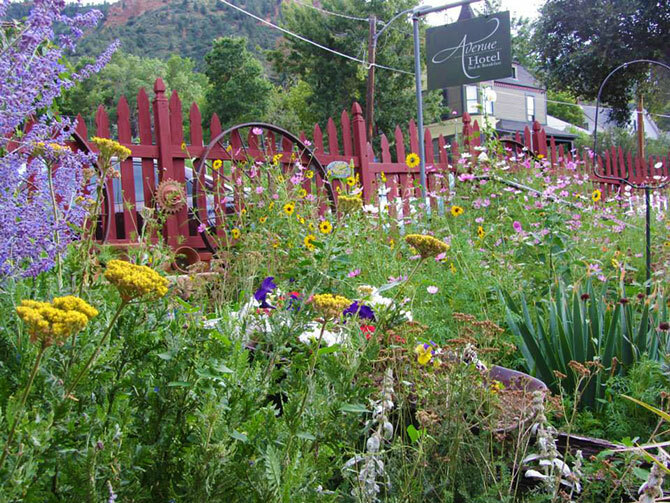 Our historic inn is the perfect place to start your Colorado adventure. Surrounded by natural beauty all of the region’s attractions are within minutes of our front door. 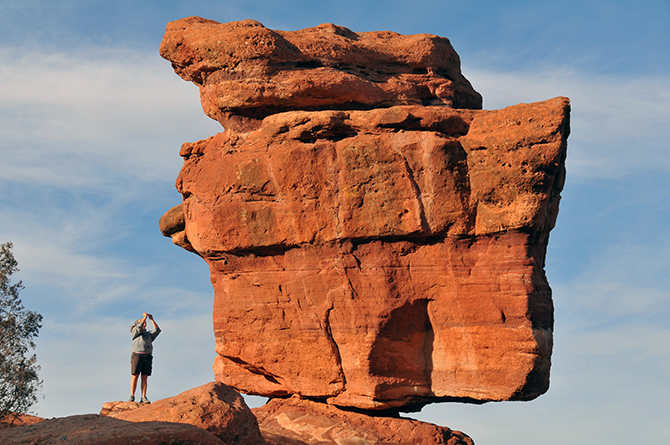 Explore the Cave of the Winds, capture the beauty of the Garden of the Gods, make memories at the Cheyenne Mountain Zoo, and witness the majesty of Pikes Peak, America’s Mountain. 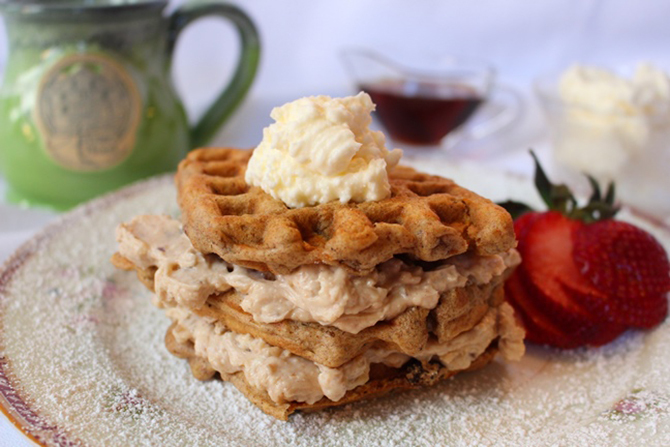 Savor a fresh, homemade breakfast every morning in our main dining room or out on our covered front porch in the summer. Locally sourced coffee and hot water for tea are available by 6 am for the early-risers. 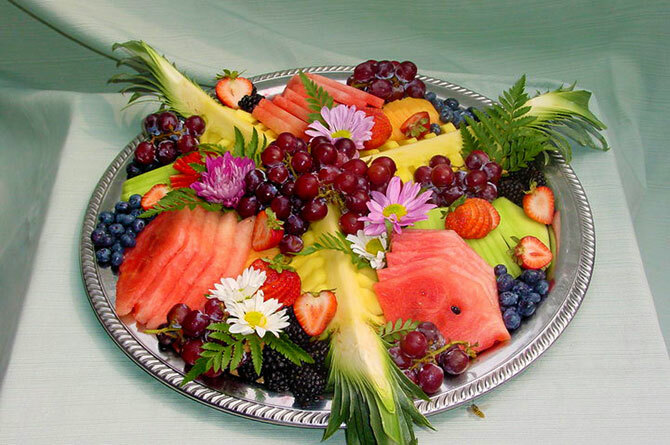 At 9 am we serve freshly baked coffeecake or muffins, our signature juice blend, fresh fruit, along with a full, plated, and hot breakfast. 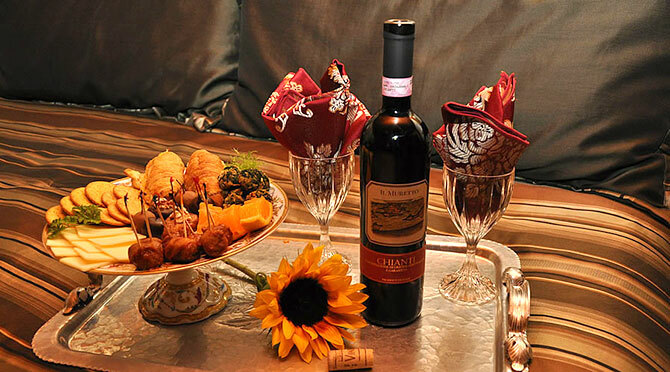 The Main guesthouse has seven beautifully appointed rooms, each with a private bath, high-quality linens, and a unique view out to the local scenery that surrounds. Guests are encouraged to relax in either of our spacious yet comfy reading parlors. Behind the main house are two 500 square foot carriage houses. One at garden level and the other overlooking the neighboring library lawn, the hot tub, and garden seating area. All of our guestrooms are decorated with antiques, heirlooms, and classic historic charm. 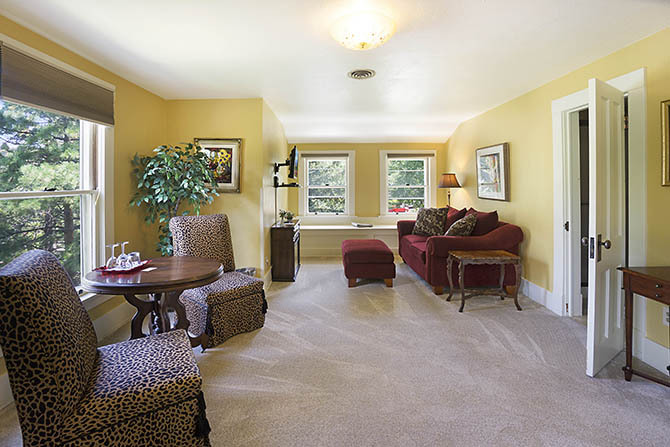 The largest luxury suite in our main guesthouse is the Manitou Suite. 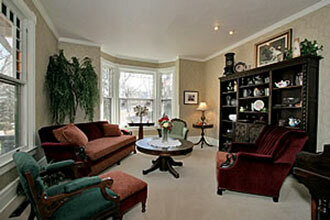 The romantic French doors divide the king-sized bedroom and the adjoining sitting room. The lovely sitting room provides an intimate and comfortable atmosphere for curling up with a book or enjoying a glass of wine at sunset. 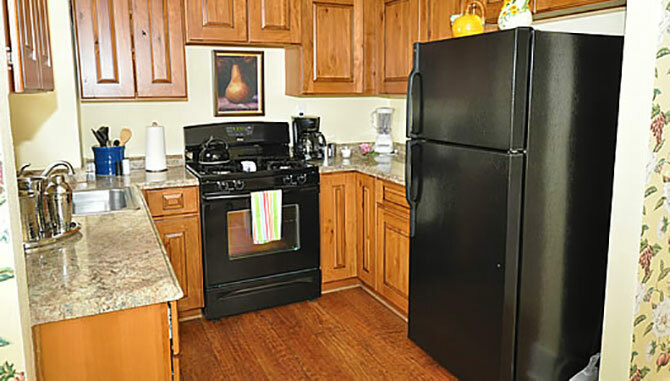 This room has recently been renovated and the private bathroom has a spacious, tiled walk-in shower. The Canon Room is a two-room luxury suite with the best view in the house! 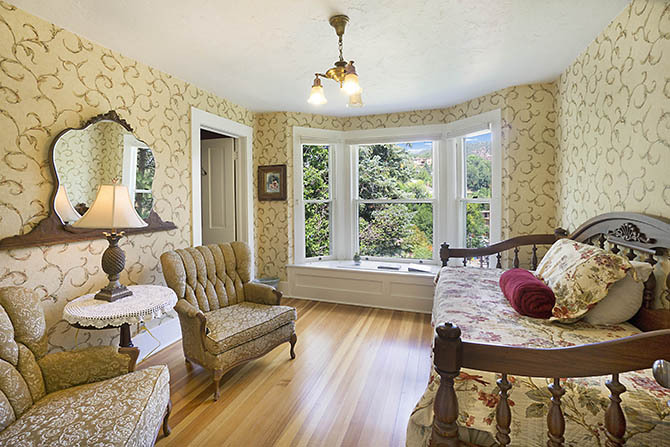 The view from the adjoining sitting room is of the historic main street and rocky mountainsides. The plush and ornate king-size bed and the deliciously deep red walls create a feeling of true vintage luxury. The ensuite bathroom includes an authentic clawfoot tub and a rainfall shower-head for a spa-like experience. 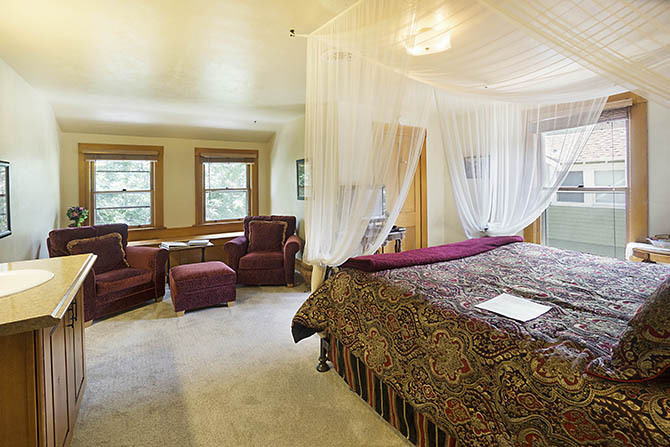 Tucked away on the third story the Osage Room gives you the feeling of absolute privacy. It’s one of our most popular deluxe guestrooms with its’ king-size canopy bed. 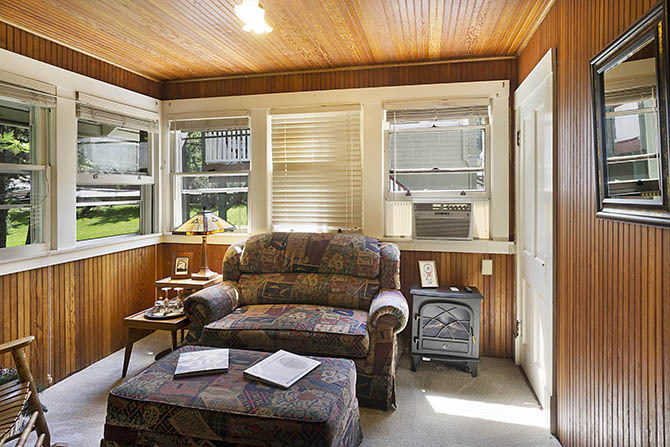 The small sitting nook is the perfect place for morning coffee. The Ruxton Room is often ‘gentlemen’s choice’. 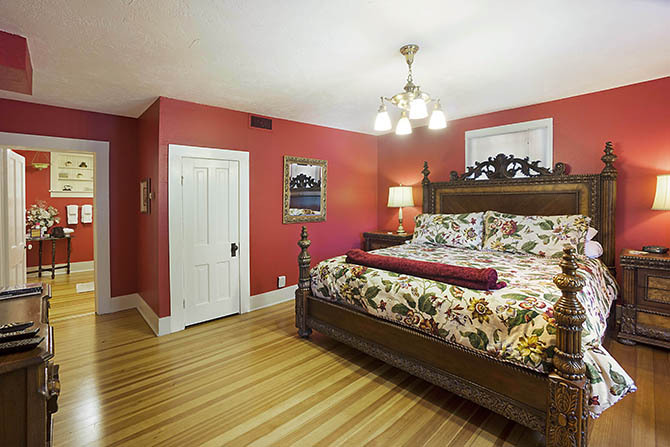 The rich cheery wood beadboard throughout the room creates a warm, inviting feel to this stately room. Wall to wall windows allow for the beautiful, Colorado sunshine to pour into the room. 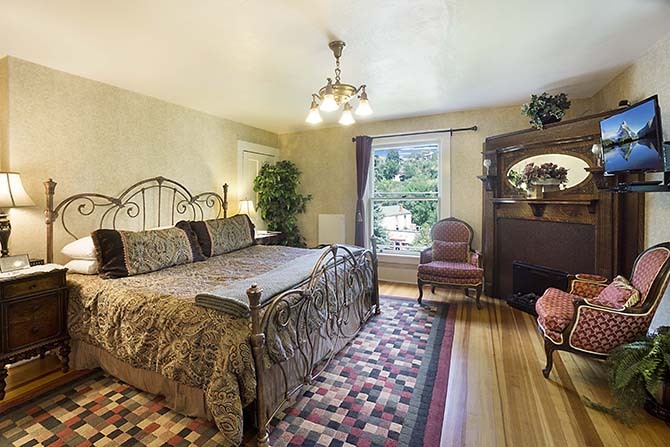 Located at the front of the house and on the second floor this beautiful master suite overlooks Manitou Avenue. 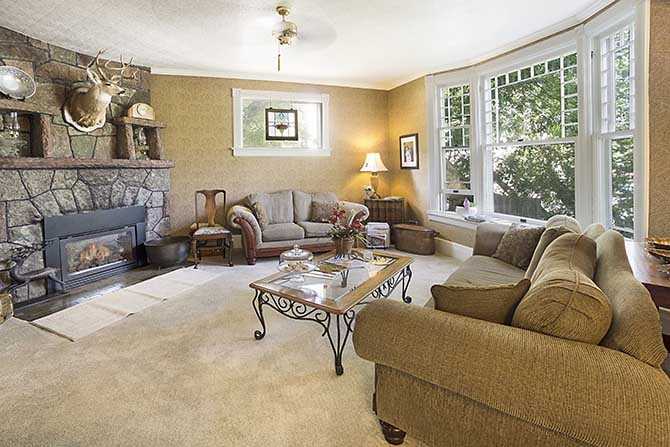 Natural hardwood floors, a king-size bed, and the corner fireplace exude elegance and romance. Adjoining the room is the ensuite bathroom with a vintage clawfoot tub, perfect for soaking. 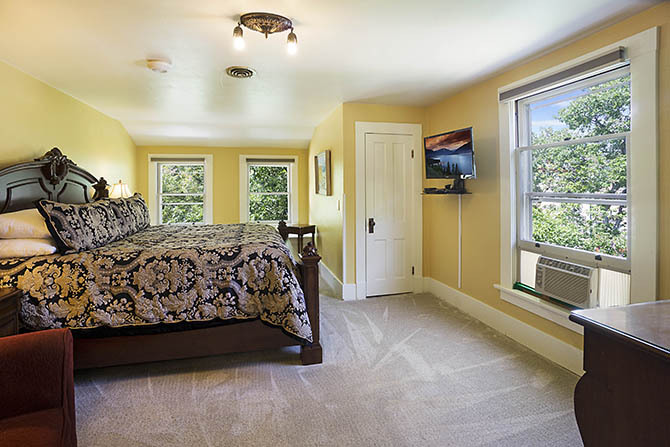 The Pawnee Room is a cozy two-room suite, electric in style and dressed with southwest rugs and artifacts. 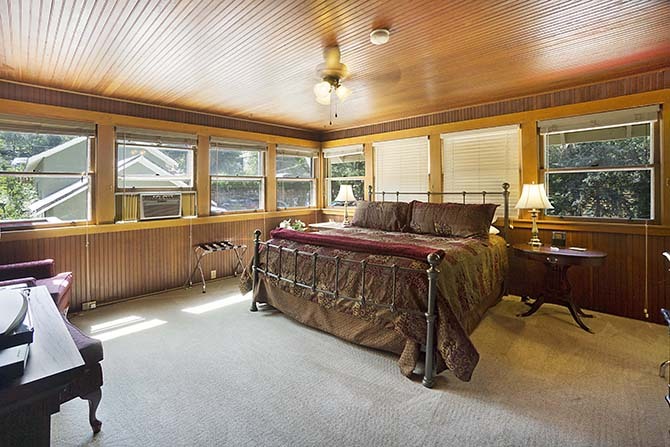 This guestroom has a queen-size bed and adjoining sunroom. Dark cherry beadboard, and wall to wall windows look out over the historic library and their lawn gardens. 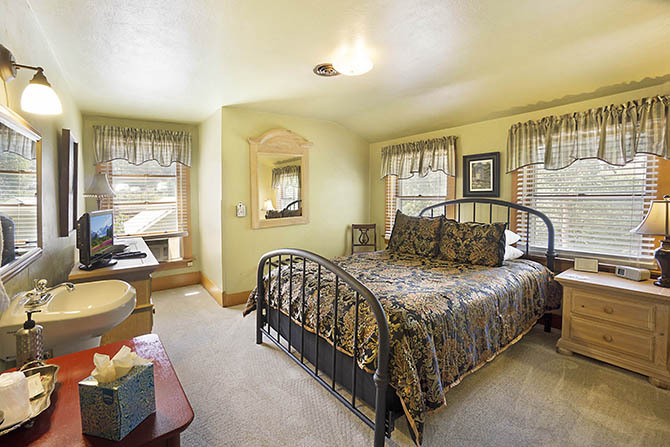 Quaint and cozy is the Pikes Peak room. 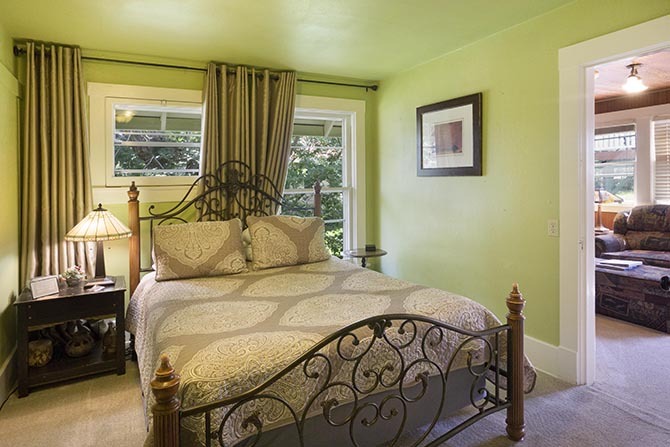 This is a secluded, queen-size guestroom with large sunlit windows. 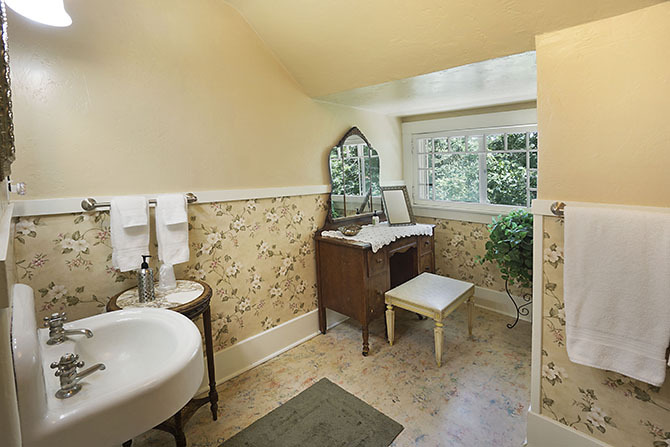 The private bathroom is vintage-perfect with its’ floral wallpaper and antique vanity. It has been recently updated with a tiled walk-in shower.